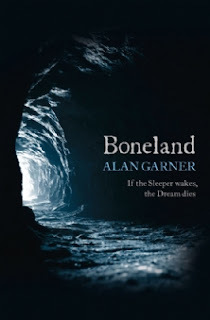 Boneland is Alan Garner’s adult sequel to his two children’s books, The Weirdstone of Brisingamen and The Moon of Gomrath, modern classics in which two children find themselves dragged into an age-old battle between mythical forces in the ancient countryside of Alderley Edge. They’re eerie, gripping and full of peril, and are strongly rooted in a sense of place and an obsession with shifts in time and repeating cycles of mythology that characterise all Garner’s work. They are also, however, relatively straightforward in plot and structure, and can also be read as nothing more than children’s fantasy adventure stories. Boneland, on the other hand, despite featuring Weirdstone’s Colin Whisterfield as its protagonist, is far more akin to Garner’s later work for adults – Thursbitch, for instance - or his more 'difficult' children's novels, Red Shift and The Owl Service. Colin, now in his 50s, seems to have acquired some sort of disorder in the autistic spectrum: a brilliant scientist plagued with neuroses and phobias, he lives alone in what seems to be a self-built camping barn and works at Jodrell Bank, endlessly pursuing a single line of research and occasionally hospitalised for bouts of an unspecified mental illness. Despite having a photographic memory of everything he has experienced from the age of 13 onwards, prior to this he recalls nothing except that he had a sister, for whom he is continually searching. Colin's story is interwoven with that of a Stone Age shaman who inhabits the same locations - perhaps thousands of years ago, perhaps at the same time ... or perhaps he's Colin himself. As in Thursbitch, Garner portrays the Cheshire landscape as a living entity in itself, its stone the very bones of the Earth, and time as something far from linear. At only 149 pages, Boneland is barely more than a novella, and yet into it Garner has managed to cram enough allusions, hints, clues, ambiguities and scope to fill a 1,000-page epic. It’s a dizzying read that sometimes seems to make no sense at all and other times, so much sense that it’s almost overwhelming. Like all Garner's later novels, Boneland dwells on themes of myth, landscape and language - and there are times when Garner suggests that these are in fact one and the same thing. This is, as ever, exquisitely expressed in sparse, flint-sharp prose that undercuts the dream-like, almost hallucinatory nature of parts of the book. Every single word counts for something – or more often, for several things – and as the reader responses to the Guardian’s review suggest, every aspect of the novel is open to a myriad of interpretations. Is Meg, Colin’s unorthodox psychiatrist, a benign mother figure or the malevolent Morrigan of the previous Alderley Edge novels? Is Colin a modern-day incarnation of Gawain, or is he to replace Cadellin, the ‘good’ wizard he and his sister met as a child? And as for his sister, it’s not so much a question of where is she now, but who? It's not so much that Boneland leaves a lot of questions unanswered. It's more that it provides so many answers that we're left to unpick them from a bewildering tangle of possibilities. It's the sort of text that makes you want to underline passages, highlight sections, look up references, all in a bid to solve the puzzle, but without even knowing what the puzzle is - rather like completing a huge, elaborate jigsaw without having access to the picture on the box. I found Boneland to be fascinating, gripping, occasionally frightening and at times desperately sad, and I will undoubtedly be re-reading the other Alderley Edge novels before reading Boneland again (this time, perhaps, with a notebook beside me too). If I have a criticism, it's that, while it's an immense pleasure to revisit Colin, Garner's beautiful prose and the Weirdstone of Brisingamen world once again, Boneland does, essentially, say much the same thing that all Garner's novels say. His favourite themes happen to be rather well aligned with my own, so I should hardly be in a position to complain, but did I get anything much different from Boneland than I did from, for example, Thursbitch or Strandloper? If I'm being entirely honest, no. This doesn't make Boneland a lesser book, but it does make me long for Garner to explore some entirely different ideas. There is reason why the book is 149 pages long. Though Garner gets the number wrong in my copy of the WoB. You can't leave it at that ! Tell .. ! In the Legend of Alderly, there are 149 sleeping knights (ref - "The Voice That Thunders"). Is Garner making amends for making it 140 in the WoB?